The shopping centre ecosystem: Banks that fund shopping centres; property developers that build shopping centres; property funds that own shopping centres; construction companies that build shopping centres; shops. Why? Because shops are middlemen and the internet is killing middlemen. In the old days (pre-internet), the only way you could show your wares was via a bricks & mortar shop. Nowadays (post-internet), there’s no more need for physical walk-throughs. Shoppers can browse in 3D, online, at their convenience, without getting in a car, hassling through traffic, finding parking and remembering to pay for the parking ticket. The only reason to go to the shops is “experience”. The utility of physical shops has been made redundant by online shopping. The internet also makes it easy for shoppers to compare prices. Gone are the days of high margins simply thanks to lack of price competition. That means even if you can convince a shopper to visit a traditional bricks-and-mortar shopping centre, that shopper won’t pay prices that aren’t competitive. Online shopping + price transparency = Shopping centre apocalypse. This is not a new prediction. Pundits have been predicting the end of retail for decades. •	Everyone has fast internet access. •	Logistics companies have solved the fulfilment conundrum. •	People trust e-commerce (10 years ago folks were afraid to use credit cards online). No amount of kid-friendly clowns and piggy water-fountains will increase footfall in shops. Everyone, and I mean EVERYONE, is trending towards buying stuff online. It’s a wave and it's unstoppable. 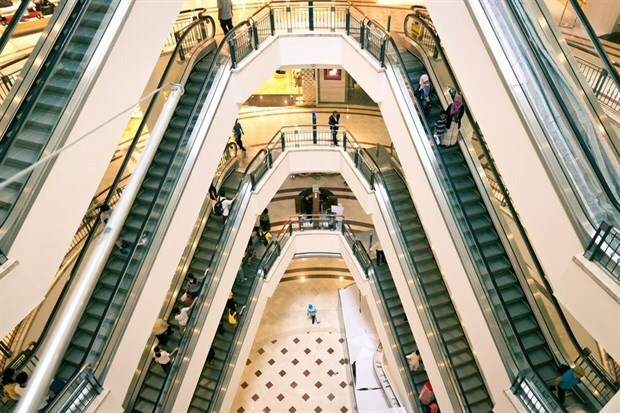 What does this mean for shopping centres? It doesn’t mean the end. But it does mean much less revenues and profits. Lower sales for retailers means lower rent for landlords means lower payback for banks means lower value for funds. It means a shrinking of the entire shopping centre ecosystem. The reason it will be apocalyptic is debt. The single most geared sector in the world is property. Banks love lending money against property. Debt is fine as long as you can service the interest. Not fine if your rental income falls below your interest payments. Definitely not fine when your total assets fall below your total debts. Profits across all parts of the ecosystem will fall. There’s absolutely nothing anyone can do to stop it (except for stop the internet). So then why do banks and insurance companies continue to fund retail construction projects? Simple answer: People believe what they’re paid to believe. If your bonus is subject to you lending R500million this year, then you will convince yourself that shopping centres have a bright future. Acknowledging the truth means you will not lend any money and you will not earn your bonus. Not facing the truth doesn’t make it go away. It just makes the ending more painful. There is an alternative. Don’t pretend it’s not happening. Don’t fall for the sugary language of all the folks with a financial incentive to ignore reality. Embrace the truth. And be an optimist. When confronted by inevitable unpleasant change you can choose: Be optimistic or be pessimistic. If the latter, it’s all “woe is me” and you freeze. Your odds of failure are locked in. You will fail. It’s better to live in ignorance than be a pessimist. At least you will be blissfully happy right up until you go off the cliff. If the former, optimism, then instead of (a) ignoring the truth, and (b) freezing, you can start thinking of how to take advantage of the unstoppable wave. The advantage of optimism in the face of apocalypse is that it is not a crowded field. You bring your domain expertise, your clients, your network, your capital base to bear on the new wave, whilst your fellow incumbents continue to blithely ignore reality, or retreat into defensive strategies driven by fear. You’ll have less competition, which is good. Competition is bad for profit. What are the bright prospects for the retail ecosystem? Who knows. Maybe it’s converting shops into collection points for bulk e-commerce purchases. Maybe it’s amusement parks. Maybe it's low-cost housing. Shops like Checkers, Woolworths and Pick n Pay have already successfully embraced home deliveries. Shops like Pep face less of a threat because they already offer the lowest prices, and buying clothes mostly requires physically trying them on. Only industry insiders can fully grasp the opportunities. But first, you must grasp the truth of the coming shopping centre ecosystem apocalypse. Don’t take it personally. It’s not the guy who made photo films’ fault that digital cameras killed Kodak. It’s not the editor’s fault that online news killed the Mail & Guardian. It’s not the book store owner’s fault that Amazon killed print books. Lamenting the apocalyptic impact of the internet is like lamenting rainy weather. It’s there. Whining won’t change anything. Instead of lamenting, learn to dance in the rain. Alan Knott-Craig is a South African entrepreneur and author. He is the founder of Project Isizwe as well as executive chairman of Hero Telecoms, Ever Africa, and Happimo NPC.